The welcoming sign at Dromore Cathedral. 10.00am: Celebrate at 10: Contemporary worship, all-age service. St. Colman of Dromore set up a small ‘daub and wattle’ church on this site in 510 AD. Probably thatched with reeds from the River Lagan. Little evidence is available for the first 700 years of St. Colman’s Church and there is no indication of either its style or size. In the twelfth century the English King Henry II revised a system of dioceses and bishops, which covered the whole of Ireland. One of those dioceses, named Dromore, took as its base this Cathedral Church. There had been bishops and abbots of Dromore before then, but from this time the history becomes more complete. A medieval church, about which no record exists, was destroyed in the late 1500s. 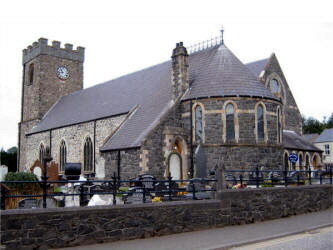 In 1609, James I issued Letters Patent giving the Church of St. Colman a new title and a new status – ‘The Cathedral Church of Christ the Redeemer, Dromore’. Much of that building was destroyed in 1641 but a new structure, with small portions of the older walls possibly incorporated, was built by Bishop Jeremy Taylor in 1661. A narrow structure, about 20 feet wide, 100 feet long was first built. It forms the base of the current Tower Aisle. A Tower was built and soon dismantled. The Percy Aisle, added by Bishop Thomas Percy in 1811 sits at right angles to the Tower Aisle, opposite the pulpits. A Semicircular Sanctuary in memory of Jeremy Taylor was designed by Thomas Drew F.R.S.A. during the ministry of Canon Beresford Knox in 1870. The Organ Aisle and baptistry were added at this time, and the Church was made rectangular with the addition of the Harding Aisle in 1899. More recently, the Dromore Cathedral Hall was opened by Mrs. Liz Miller and dedicated by the Right. Rev. Harold Miller - Bishop of Down and Dromore in October 1999. The church was completely reroofed in two stages and the work was completed early this year (2006). The Rector, the Rev. Stephen Lowry, was instituted here in June 1998 and appointed Dean of Dromore in July 2002. The Curate, the Rev. Trevor McKeown, was ordained in June 2004.